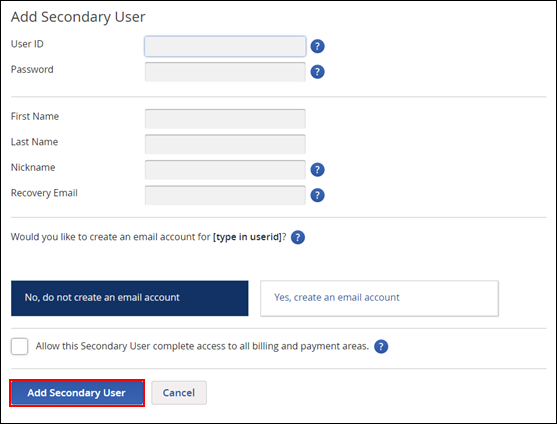 Use the following steps to create a secondary user in My Account on Cox.com for email and apps. Only the primary User ID has access to create a secondary user. Under My Profile, click Users & Email Accounts. User ID - Enter a user ID. Password - Create a password and re-enter the password. Click the ? for guidelines. Note: A password strength meter shows you the security of the new password that you enter. First Name - Enter the first name of the user. Last Name - Enter the last name of the user. Nickname - Enter a nickname for the user ID. This step is optional. Recovery Email - Enter an email address that will be used to recover a forgotten password. Would you like to create an email account for your new user ID? - Select No, do not create an email account or Yes, create an email account. Allow this Secondary User complete access to all billing and payment areas. - Place a check in this box to grant an Authorized User the same access to the account billing and payment areas as the Account Holder. On the account security pop-up window, complete the requested actions, then click Next. On the second security pop-up window that displays, complete the requested actions, then click Verify. Result: The Users & Email Accounts window displays a green confirmation banner and a confirmation email or letter is sent.